All 10th grade students are scheduled to participate in Albany High School’s Challenge Day over a three day period - Monday, February 4, Tuesday, February 5th and Wednesday, February 6th at the Veterans’ Memorial Building on Portland Avenue. Many teachers will be participating in the activities as well and all teachers are aware that ⅓ of their 10th grade students will not be attending their regular classes on those days. 10th graders will be attending only one of those days and will be randomly assigned a day to participate. For more information about the event, or to have your child opt-out, please click here. As we begin our spring semester, please take a few minutes to read through some important updates below. Our WASC (Western Association of Schools and Colleges) accreditation visit is this year. We will be hosting a committee of school educators March 17th-March 20th and will be inviting students and family representatives to a brief reception on Sunday March 17th from 3:30-5:00 in our library. Please rsvp to aritchie@ausdk12.org if you would like to attend. Come have coffee with your principal and PTSA president Natali Gayinsky on Friday, February 8th from 9:00-10:00 am in our front lobby atrium. Bring questions, concerns and ideas to strengthen the school-home partnership. One of the indicators that impacts student achievement is good attendance. Last year, Albany High School saw an increase of .72% in positive attendance! Not only does this coincide with a .2% increase in our overall graduation rate, but it also translates to over $20,000 in additional revenue per ADA (Average Daily Attendance). Please allow me to take this opportunity to thank our students and families for making school attendance a meaningful priority. Have a wonderful semester and please join me in our countdown to the ℅ 2019 graduation date on June 14th! Hola amigos! Familias Latinas de Albany is celebrating el Dia de Candelaria with tradiitonal tamales, and not-so-traditional games! We're going to play Nintendo Switch games, mobile games, and even some classics on PC. Bring a friend, an appetite, and your A-game to Cornell Elementary's multi-purpose room at 920 Talbot Avenue, on February 2nd, from 3pm to 6pm! Join us for the City of Albany Climate Action and Adaptation Community Workshop on Wednesday, January 16th from 7pm-9pm at Albany City Hall to help brainstorm innovative mitigation and adaptation strategies for the City’s new Climate Action & Adaptation Plan and provide input on proposed strategies to reach net zero emissions by 2050. Learn more here. The Association of Black Admissions and Financial Aid Officers of the Ivy League and Sister Schools (ABAFAOILSS) invites you to attend our College Access & Success Symposium. College representatives from some of America's top institutions will provide valuable insight and advice during workshops on the college admission and financial aid application processes. The program will include workshops for high school students and parents simultaneously. To attend, please click here to complete the registration form. Thursday afternoon administrators were given a photo captured from Snapchat showing two AHS students with their arms raised in what some interpreted to be a Nazi salute. Staff looked into the incident and followed up with the students and families involved. 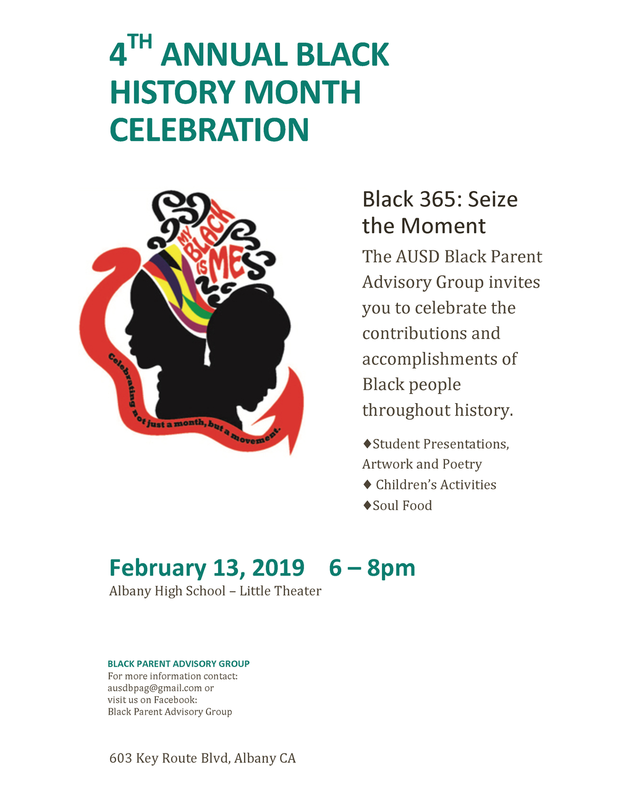 AHS administrators determined there was no intent to convey an inappropriate message through the image, which was a reference to popular social media content entirely unrelated to Nazi imagery or sentiments. We continue to encourage students to reach out to administrators, teachers or staff if they feel uncomfortable or unsafe at school for any reason. We will continue to work together to ensure AHS is a safe, inclusive community for all its members. How Will You Help Address Our Vaping Problems? I’m extending an invitation to everyone who knows that our country, city and school has a vaping problem and wants to be part of the solution. Please consider the follow information and decide how your role in our community can help reduce this dangerous trend. Administrators and campus security will increase the number of unannounced restroom inspections in all buildings and on all floors. The possession and use of all smoking/vaping products is a violation of Education Codes and consequences are outlined in our Behavior Matrix (the current AHS Behavior Matrix can be viewed here.) Thank you for respecting this rule within our community and on school grounds. The Albany City Council will be hosting a study session on the effects of flavored tobacco products and the possibility of a city wide ban. You are welcome to attend that open session at City Hall this Monday, December 3 @ 6:00pm. The location is 1000 Jackson Street and the meeting is open to everyone. Our very own Albany High school peer Tobacco Use and Prevention Education team sponsored the “Great American Smoke/Vape Out” today,. Many of you came by and caught up on how students in our area are finding ways to avoid this destructive addiction. Talk to Ms. Josette, program coordinator, on how you can join the efforts. Once again, I need your help and commitment to address this growing problem in our community. Please feel free to email me with any comments, questions or suggestions as we work towards a common goal, dedicated to the welfare of all Albany High School students.